Ingredients: Floor malted Optic malt; Fuggles and Super Styrian hops. 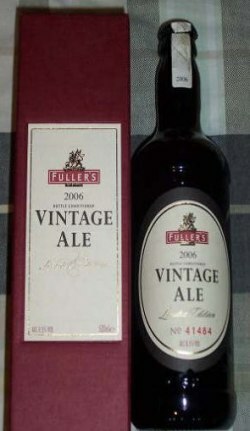 This full-bodied vintage is brewed with Fuggles and Super Styrian hops that create a tapestry of rich, spicy flavours. Orange, citrus and fruitcake notes are all present, and are balanced well with the biscuity, creamy malt flavours leaving a soft and warming finish. UPDATED: DEC 28, 2018 I am drinking this beer on 25/12/2018 after it has had 12 years in my cellar. It poured a dark amber ale. Good carbonation but small head. Fruity nose. Slight musty. More fruit on the tongue and dry malt notes. Very little hop. Promoted saliva. Dry slight hoppy finish. Very surprised to see the Fullers website selling them for £400 EACH! A lot cheaper on eBay for £50. Bottle shared at the CBC Islington for the Matteo farewell tasting. From bottle shop druid Street. Amber brown coloured pour with a lose beige head. Aroma is nice sweet jammy fruits, strawberry, toast and toffee. Flavour is composed of of semi sweet, airy stale malts, jammy fruits, dried fruit, raisin cake. Pretty good. Palate is semi sweet, moderate carbonation, woody. Held up pretty well. 500ml bottle. 2006, No. 00065. Dark reddish-brown amber colour, creamy tan foam head leaving lacing and aroma of malt, toffee & zesty orange citrus. Taste is malty, treacle, toffee, caramel, chocolate, brown sugar, with some dried fruit & orangey hop bitterness. Smooth mouthfeel, medium bodied, soft carbonation, dry nutty spicy earthy finish. Very drinkable. Hazy amber color with beige head. Aroma has dark fruits and caramel with a hint of alcohol. Taste is really balanced with caramel malt and earthy bitterness. Smooth mouthfeel. Bouteille achetée Au Grain D’Orge en 2010 – Bouteille N°01070 - De couleur brune avec une fine mousse blanche qui diminue assez vite pour ne laisser qu’un petit col – Au nez des arômes de madère, de malt caramel, biscuits, un nez sucré par le malt, fruits confits, prune, figue et raisin – En bouche un peu d’amertume apparait, toujours beaucoup de fruits sec et de fruits confits, raisin figue, prune, malt doux – Corp moyen, amertume légère/moyenne, carbonations légèrement plate, douce mais qui commence légèrement à devenir aqueuse – Gouter en parallèle avec une 2010 et une 2014, c’est clairement la meilleures des trois, il ne faudrait pas la garder beaucoup plus longtemps. Mais vraiment extraordinaire. Bottle #54356. Slightly hazy reddish brown. Decent cap that remains a thin blanket. Aroma of raisin, plum, caramel, alcohol, fig. Taste is sweet, and slight umami. Palate is medium carbonation, smooth, creamy, warm slightly dry finish. Held up great. (Bottle 06414) Slightly hazy reddish brown with tiny short-lived tan head. Pleasant aroma, primarily toffee with hints of raisins, port and burnt sugar. Full-bodied, slightly oil, slightly sticky giving lovely rich smooth mouthfeel, with fine prickly carbonation. Rich warming taste. Rich toffee sweetness is the dominant flavour. This is partnered with raisins and alcohol, reminding me of Tokay. There’s some burnt sugar bitterness in the background providing balance. Maybe a hint of plums or prunes. There’s a little bitterness in the finish, but it more burnt sugar than hops. A very fine strong ale.